(Hong Kong, 17 October 2011) At 4:28 p.m. today, The Dragon roller coaster experienced failure on one of its track sensors which is used to monitor the position of the train. This triggered the safety protection device of the ride and caused a train to be temporarily suspended after having shortly left the boarding platform. On-site staff immediately began assisting on-board passengers to exit the train one by one through the built-in evacuation passage beside the track and the first passenger was safely exited at 4:54 p.m. By 5:30 p.m., all 27 passengers exited safely from the coaster to the ground without any injury. Two guests were evaluated at a nearby first aid post for slight discomfort, but no treatment was required and the guests were released shortly after. We have notified EMSD of the incident immediately. Upon examination by Ocean Park, it was found that the incident was caused by failure in one of the track sensors, which locked the train on the track to ensure the safety of all passengers. Ocean Park is now performing thorough testing after replacing the failed track sensor. The ride will be re-opened after passing all safety checks. We apologize for any inconvenience caused by this incident. 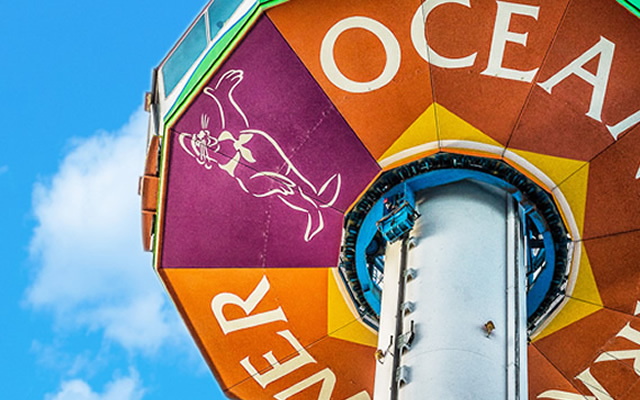 The safety of our guests has always been the number one priority of Ocean Park, and we will continue to do everything in our capabilities to ensure that a safe and enjoyable experience is provided to all of our guests. The Dragon was manufactured in United States of America and first opened in 1984. The last time passengers exited from the train through the built-in evacuation passage was in March 2009.